Purdue open rider Laura Lemanski had as good a day as anyone at Zone 9 Zones on April 1st. Lemanski placed second in both individual open classes and won team open fences. 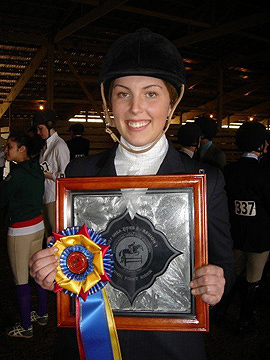 Lemanski, who is also the Purdue Assistant Coach, is seen here with her award for High Point Open Rider Honors in Zone 9, Region 1 for the 2006-07 season (Photo Courtesy Christa Wessels/Purdue University Equestrian Team). Lake in the Hills, IL - Despite both teams earning a zero in a team class, Purdue University and the University of Wisconsin at Madison finished in a tie for first with 40 points, thus both schools survived Zone 9 Zones to take full hunter seat teams to IHSA Nationals. Host Northern Illinois led early, but four consecutive third place ribbons to close out the team scoring left them in third with 35 points. NIU open rider Michael Lenard, who was already qualified for IHSA Nationals as the Region 2 Cacchione rider, won the very first individual class of the day, which was individual open over fences. The individual open classes were dominated by the Zone 9 Cacchione riders, as Lindsey Willard of the University of Wisconsin at Madison won open flat while Laura Lemanski of Purdue was second to Lenard and Willard in both divisions. Lenard and Willard also swapped thirds in these divisions. Individual riders from Region 1 faired the best, securing eight of a possible 16 rides at IHSA Nationals divided amongst six different schools. Saint Mary of the Woods College, historically boasting a very strong Western program, qualified Sarah Kniesly in individual walk-trot-canter and Molly Migliaccio in individual novice flat. Kniesly was a zone champion while Migliaccio finished second to Macie Ayers of Kansas State. Ayers' Wildcat teammate Dresden Sommer also won, earning the blue ribbon in individual intermediate flat. Both of the Dakota state schools will be represented at Nationals, as Katie Beaudine of North Dakota State was second in individual walk-trot while Kaylee DeVries of South Dakota State was second to Sommer in individual intermediate flat. Though the University of Wisconsin at Madison will have two individuals and a full hunter seat team at Nationals, another member of the University of Wisconsin system will also send a rider to the Eastern States Exposition. Catherine Buller of the University of Wisconsin at River Falls was second to Kniesly in advanced walk-trot-canter and is thus one of five individuals from Region 3 to move on to Nationals. Tiebreaker situation: When Lydia Sorensen of the Badgers won team walk-trot it created a tie for high point team with the Boilermakers. Though both schools automatically advanced, the IHSA likes to settle specifically which team is champion at Zones. The tiebreaker in past seasons would have been a ride-off. However the rules changed for 2006-07 so that the first tiebreaker is the number of firsts for the day. Purdue and Wisconsin - Madison were still tied with that one. The second tiebreaker is the number of second place ribbons for the day. Again, the two teams came out even. The third tiebreaker is points over fences. Thanks to firsts for Kelli (or Kellie) Parsons in team intermediate fences and Lemanski in team open fences (the only rider in that division to earn any points) the Boilermakers earned the blue ribbon. Had there still been a tie the fourth tiebreaker would have, in fact, been a ride-off. Individual Open Equitation Over Fences: 1. Michael Lenard, Northern Illinois University. 2. Laura Lemanski, Purdue University. 3. Lindsey Willard, University of Wisconsin at Madison. 4. Kelsey Ostberg, University of Notre Dame/Saint Mary's College (IN). 5. Alex Szarmach, Northern Illinois University. Team Open Equitation Over Fences: 1. Laura Lemanski, Purdue University. Individual Intermediate Equitation Over Fences: 1. Kate Wichman, University of Illinois (Urbana - Champaign). 2. Carly Swatek, University of Wisconsin at Madison. 3. Josie Fowler, Earlham College. 4. Tori Holekamp, Washington University. 5. Emily Costello, Truman State University. 6. Mary Beth Schmoller, University of Wisconsin at Madison. Team Intermediate Equitation Over Fences: 1. Kelli Parsons, Purdue University. 2. Niki Johnson, Northern Illinois University. 3. Sarah Korenthal, University of Wisconsin at Madison. Individual Novice Equitation Over Fences: 1. Brittany Gragg, University of Notre Dame/Saint Mary's College (IN). 2. Erin Whitmore, DePauw University. 3. Jenna Kyhl, Illinois Wesleyan University. 4. Anna Wagner, University of Wisconsin at Madison. 5. Claire Patterson, University of Wisconsin at Madison. Team Novice Equitation Over Fences: 1. Brittany Lanphear, Northern Illinois University. 2. Karen Kearney, University of Wisconsin at Madison. Individual Open Equitation on the Flat: 1. Lindsey Willard, University of Wisconsin at Madison. 2. Laura Lemanski, Purdue University. 3. Michael Lenard, Northern Illinois University. 4. Celia Barenfanger, University of Wisconsin at Madison. 5. Alex Szarmach, Northern Illinois University. 6. Jill Roundtree, University of Illinois (Urbana - Champaign). Team Open Equitation on the Flat: 1. Alex Szarmach, Northern Illinois University. 2. Celia Barenfanger, University of Wisconsin at Madison. 3. Laura Lemanski, Purdue University. Individual Intermediate Equitation on the Flat: 1. Dresden Sommer, Kansas State University. 2. Kaylee DeVries, South Dakota State University. 3. Katherine Presson, Indiana University. 4. Kerry Rheinstein, Washington University. 5. Allison Carrie, South Dakota State University. 6. Lindsey Brizendine, Earlham College. Team Intermediate Equitation on the Flat: 1. Carly Swatek, University. 2. Kelli Parsons, Purdue University. 3. Heather Perelgut, Northern Illinois University. Individual Novice Equitation on the Flat: 1. Macie Ayers, Kansas State University. 2. Molly Migliaccio, Saint Mary of the Woods College. 3. Ari Mishkin, Washington University. 4. Marie Mario, Indiana University. 5. Anna Wagner, University of Wisconsin at Madison. 6. Corey Ramsden, University of Minnesota at Crookston. Team Novice Equitation on the Flat: 1. Joyce Williams, University of Wisconsin at Madison. 2. Kelly Keuneke, Purdue University. 3. Kaitlynn Sullivan, Northern Illinois University. Individual Walk-Trot-Canter Equitation on the Flat: 1. Sarah Kniesly, Saint Mary of the Woods College. 2. Catherine Buller, University of Wisconsin at River Falls. 3. Lianna Bodlack, Kansas State University. 4. Dana Reedy, University of Wisconsin at Madison. 5. Lauren Kapernaros, Purdue University. 6. Katie Edwardo, Kansas State University. Team Walk-Trot-Canter Equitation on the Flat: 1. Amber Lieneck, Purdue University. 2. James Winsor, University of Wisconsin at Madison. 3. Brian Mitchell, Northern Illinois University. Individual Walk-Trot Equitation on the Flat: 1. Gabriela Sloan, Indiana University. 2. Katie Beaudine, North Dakota State University. 3. Erika Kvam, Indiana University. 4. Samantha Langren, Truman State University. 5. Bradley Merts, Southern Illinois University at Carbondale. Team Walk-Trot Equitation on the Flat: 1. Lydia Sorensen, University of Wisconsin at Madison. 2. Marissa Combs, Purdue University. 3. Kevin Hantosh, Northern Illinois University. Final Hunter Seat Team Totals, with the top two teams advancing to IHSA Nationals May 3rd through 6th In Springfield, Massachusetts: Purdue University 40, University of Wisconsin at Madison 40 and Northern Illinois University 35.